Delightful Beswick rabbit, scratching its ear. This is a discontinued Beswick item, retired in 1971 and designed by Arthur Gredlington. Big Rabbit Small Rabbit There are a few minor signs of wear here and there but otherwise they are in good condition. Width - 1.5cm. Width - 3.5cm. It is believed that the older models had more detailing and better paint detail. BESWICK BROWN RABBIT ON HIND FEET. 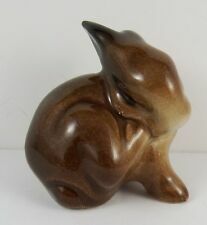 BESWICK BROWN BABY BUNNY. It is Beswick number :~ 824. Made by Beswick it is the lovely :~ Rabbit Scratching Ear. The pictures are taken in close up macro and therefore could show blemishes that are not necessarily seen by the naked eye. John Beswick Studio Sculptures. Dated 1984. Lovely fine detail, on this hand decorated in England.